The state of limbo between the "before" and the "after" is filled with all sorts of notions: transitions, processes, even apprehensions and doubts. Each of these notions is intimately linked with art and examples of what this looks like can be found in the exhibitions featured below. 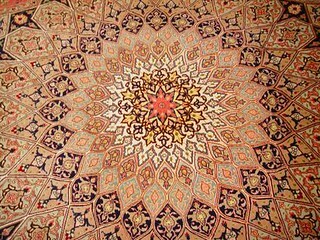 Subjects such as stability, journey and perception are tackled by artists in various mediums. And, if you're looking for exhibitions to put on your radar before and after the New Year, the ones in this blast will certainly do. Happy holidays from ours to yours! Scott City by Paige Berg Rizvi. 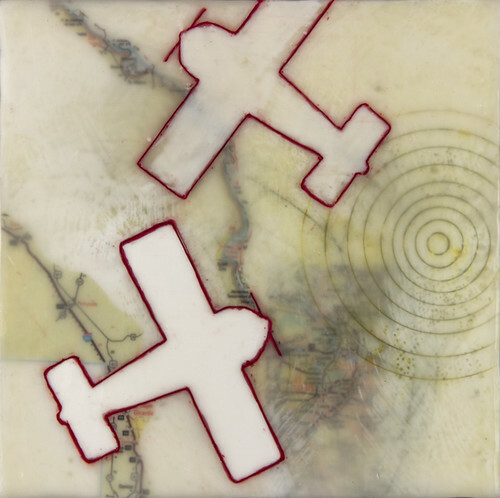 Encaustic, Oil, and Archival Inkjet Prints on Wood Panel, 2014. While terrain can denote the most stable physical aspect of our planet, it can also be ephemeral, philosophical, even imaginary—a field of knowledge and creativity as much as texture and geography. In a call to artists circling around the real and the imagined, Fountain Street Fine Art asked creators to use the word "terrain" as a starting place for their art. Participating artists were encouraged to interpret, explore and stretch the concept of terrain—to find visual poetry and play with its meanings. 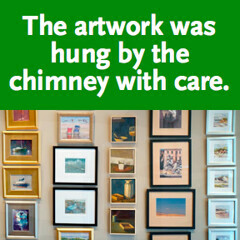 Nearly 200 artists across the country submitted about 350 works of art. Forty-one pieces by 39 artists were selected for inclusion into the show, Terrain: Finding Elusive Ground. Exhibiting artists include Brenda Cirioni, Betty Glick, Richard Kattman, Paige Berg Rizvi, Pip Shepley and Jeff Woodbury, among others. Juror John Colan commented that, "Beyond the literal, there are infinite interpretations for the idea of terrain—as an analogy, or metaphor, perhaps—so many avenues to explore artistically, in any medium." Colan asked Shana Dumont Garr, gallery director at Kingston Gallery and former assistant director at Montserrat College of Art, to choose the awardees from the juried work. Roz Sommer was awarded first place for his works Cove Woods and Small Green With Pink. Of his artistic range, Sommer says, "Expressive qualities of paint, particularly oil paint, are the elements that connect my various bodies of work. Thick, juicy, textural color, as well as dramatic light and shadow emphasize the intensity of my subjects." Second place went to Lorraine Sullivan and Honorable Mention was given to Sarah Trahan. Terrain: Finding Elusive Ground is on view now through Sunday, January 10. 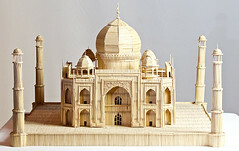 Stan Munro uses his ingenuity and toothpicks to construct precise 1:164 scale reproductions of world-renowned structures like St. Basil's Cathedral of Moscow and the Taj Mahal of Agra, India. Also see some local landmarks like Fenway Park, Hancock Place, and Trinity Church. Toothpick World Build and Play Family Day, Sunday, January 17, 2016, 10:00 am - 4:00 pm. 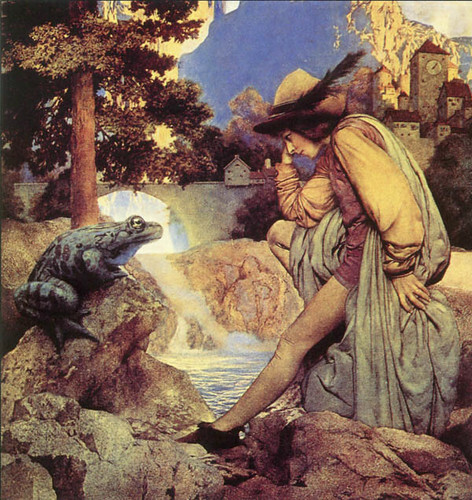 Frog Prince by Maxfield Parrish. The idiosyncratic blended artistic style of Maxfield Parrish is perhaps what made him one of the most popular American artists of the early 20th century. Balancing a line between realism and fantasy, Parrish created images that were enjoyed by elite collectors and the American public alike. More than fifty of his most famous works, including a selection of original oil paintings, are on view in Currier Museum of Art's Maxfield Parrish: The Power of the Print. This focused exhibition aims to explore how and why Parrish became, and remains, such a popular American artist. "Maxfield Parrish combined the creativity and virtuosity of a fine artist with the keen business sense of a commercial artist," says curator Samantha Cataldo. "His figural and landscape paintings were masterfully rendered and greatly appealing, but it was his engagement with the emerging printing technology of the time that catapulted him to fame." The Power of the Print features vintage lithographic prints, ads, posters, magazines, books, greeting cards and calendars that host Parrish's works. 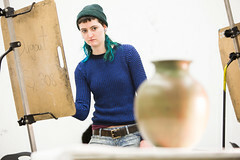 The exhibition is largely drawn from private collections, but also includes work from the Currier's collection, as well as from the Hood Museum of Art at Dartmouth College. In addition, it features several Parrish paintings, including the Currier's visitor favorite, Freeman Farm: Winter (1935). Maxfield Parrish was born Frederick Parrish in Philadelphia, Pennsylvania in 1870. He studied architecture at Haverford College, and art at the Pennsylvania Academy of the Fine Arts as well as at Drexel Institute, where he audited courses with famed illustrator Howard Pyle (1853-1911). In 1898, Parrish moved to Plainfield, New Hampshire, near Cornish, where he built his home and studio, which he named "The Oaks" after the distinguishing trees on the land. He lived there until his death in 1966. Maxfield Parrish: The Power of the Print is on view now through Sunday, January 10 at Currier Museum of Art. 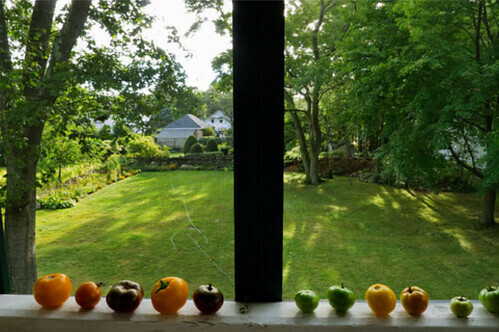 Late Summer Tomatoes by Mary Lang, Auburndale, MA, archival pigment print, 2015. With holidays, vacations and end-of-year celebrations on the horizon, 'tis the season to be busy and the exhibition schedule at Kingston Gallery is no exception. Now through Sunday, December 27 the gallery is showing three separate exhibitions revolving around very different themes. The Main gallery is home to How to Feel Real, a group exhibition about authenticity in a virtual age. Curated by Shana Dumont Garr, this show features a range of media to point out rituals or systems that either keep us from feeling at home with ourselves, or bring us back. The artists with their works on display are Stacey Alickman, Kellie Bornhoft, Linda Leslie Brown and Hilary Tolan. Taking place in Kingston Gallery's Center gallery is Everything is God To Me and Everything is Dust to Me, a solo exhibition by Greg Lookerse that integrates sculptural and performative works to create a space for critical and dynamic engagement with literature, ritual, spirituality and self-consciousness. For this exhibition Lookerse incorporates both meaning and literal pages from Annie Dillard's "Teaching a Stone to Talk" and Teilhard de Chardin's "The Divine Milieu" and combines them into a performance put on throughout the month. The third exhibition being hosted by Kingston Gallery this December is Mary Lang: Nothing That is Not There, being shown in the Members' Gallery. Lang's photography spans both the immense and the immediate, encapsulating vast geographic expanses in one series and the mundane details of daily life in another. Of her artistic intentions, Lang says, "More and more, I try to express the possibility that we can trust our experience as it unfolds, moment by moment; that we can pay attention without fear to the details of everyday life, held within awareness without boundary." Through her lens and therefore her perception, Lang captures the elemental and emotional quality of the subjects she shoots. All three of these exhibitions are running concurrently at Kingston Gallery through December 27. Gallery hours are Wednesday through Sunday from 12-5 p.m. and by appointment. Over 600 small works, $300 or less.